I have borrowed the information and images below from Jeff Fecke at Alas A Blog. His discussion, if you’re interested, is more in depth. There is a winding line of counties stretching from Louisiana to South Carolina, a set of states that largely voted for McCain in 2008, that went for Obama. 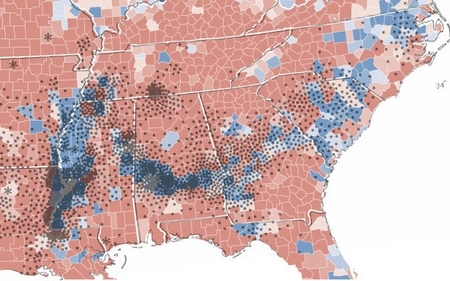 The map below shows how counties voted in blue and red and you can clearly see this interesting pattern. Along the ancient coastline, life thrived, as usually does. It especially thrived in the delta region, the Bay of Tennessee, if you will. Here life reproduced, ate, excreted, lived, and died. On the shallow ocean floor, organic debris settled, slowly building a rich layer of nutritious debris. Eventually, the debris would rise as the sea departed, becoming a thick, rich layer of soil that ran from Louisiana to South Carolina. 65 million years later, European settlers in America would discover this soil, which was perfect for growing cotton. 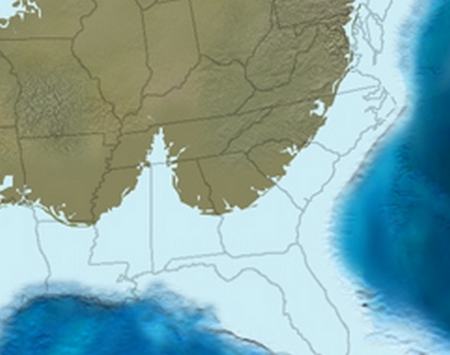 So there you have it: the relationship between today’s political map, the economy, and 65 million years ago. So freak'n cool! I was just about to send it to all of my friends, before I remembered that most of my friends are nowhere near as nerdy as me. I think you meant to say, "after slavery was ended, many of the freed slaves were forced to stay." 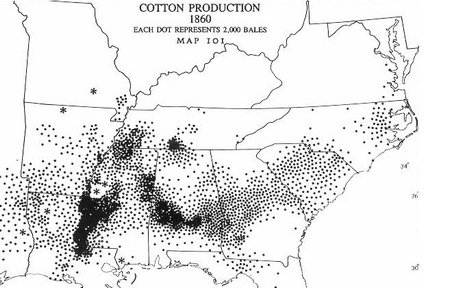 "Vagrancy" laws, the "Black Laws" in Mississippi and other places, convict leasing schemes (and the programmes of mass arrest that fed them), and other tactics by white landowners made sure that there was an ample supply of exploitable and essentially movement-restricted black labour in that area. David M. Oshinski covers this in detail in Worse Than Slavery. That is really interesting. Especially for someone from the UK. A little tour de force; thank you! Oh you and your 65 million years ago! Very nice find. This Interpretive Naturalist appreciates the connections! FYI, "the black belt" does not refer to the presence of African-Americans. It refers to the rich black soil of the region. Should all the black folks move away, it would still be the Black Belt.